Metallic wallpaper is trending this year and the selection of styles and patterns is better than ever. 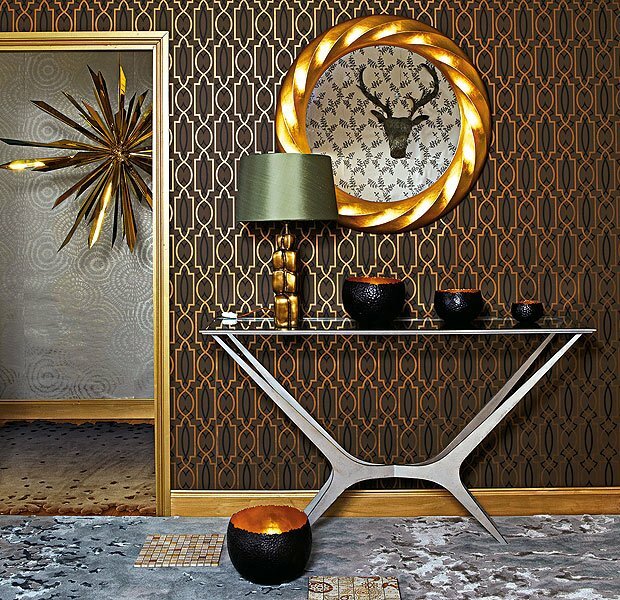 Glistening metallic enlivens a space and gives it dimension and textural appeal. 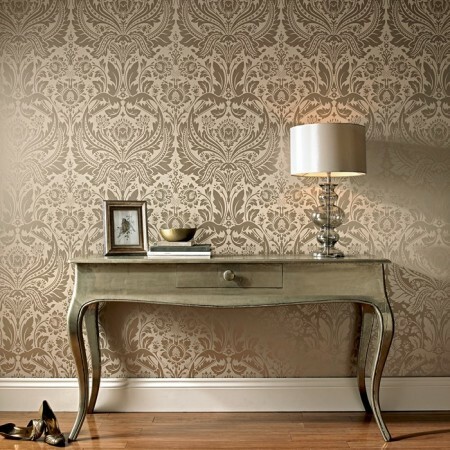 Whether it’s for the living room, dining room, bedroom or bath, metallic wallpaper sets the tone for a chic aesthetic. 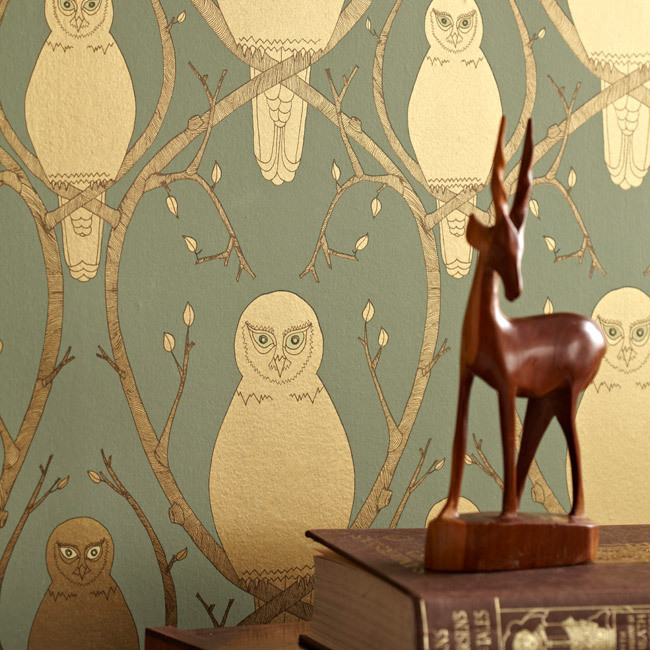 Here are examples of metallic wallpaper for adding shimmer, character and dimension to your walls. 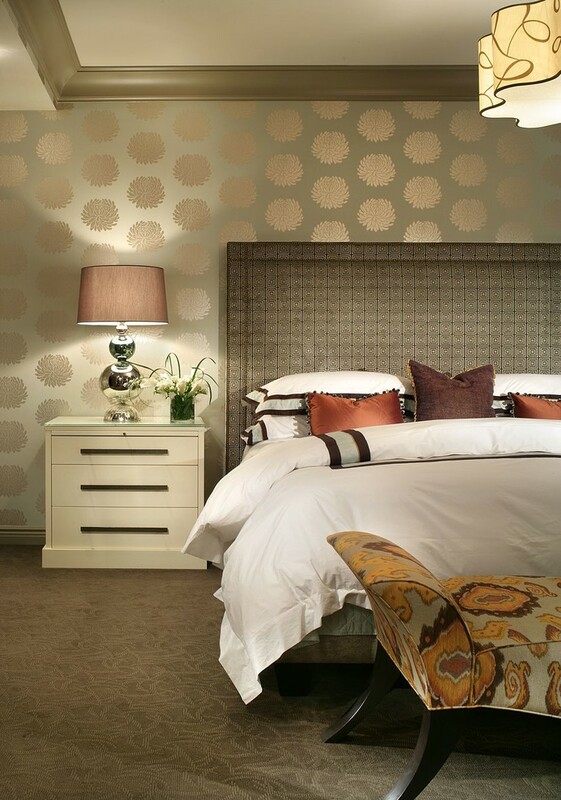 Metallic wallpaper brings a richness and layer of texture to a room. 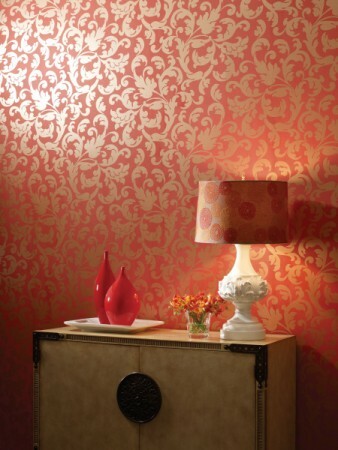 It gives walls a visual lift and a touch of glamour. 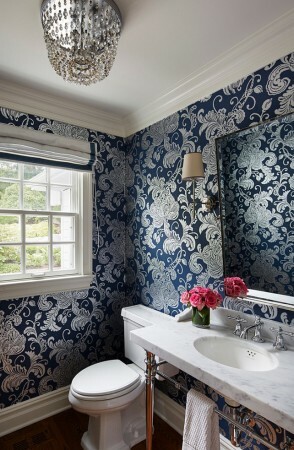 Swirling patterns of damask and elegant floral motifs are a classic look. 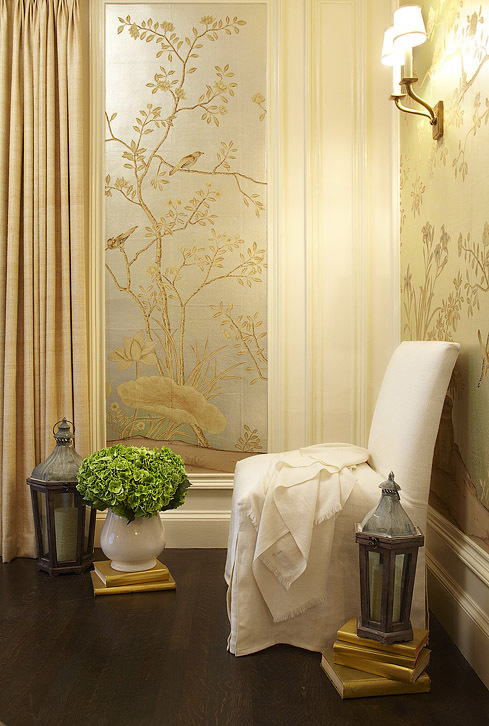 Birds and nature-inspired motifs of chinoiserie infuse elegance and grace into traditional interiors, while modern wavy lines on gold shimmer beautifully in contemporary and traditionally styled rooms. 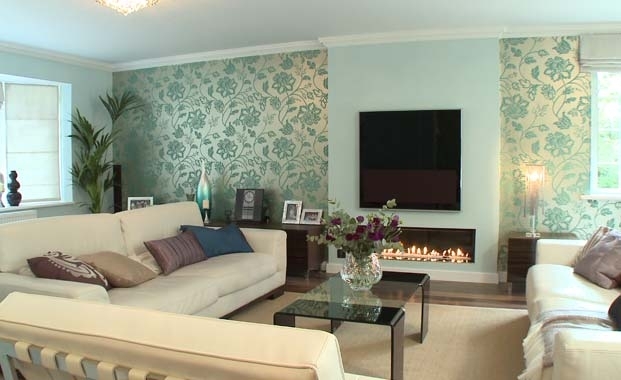 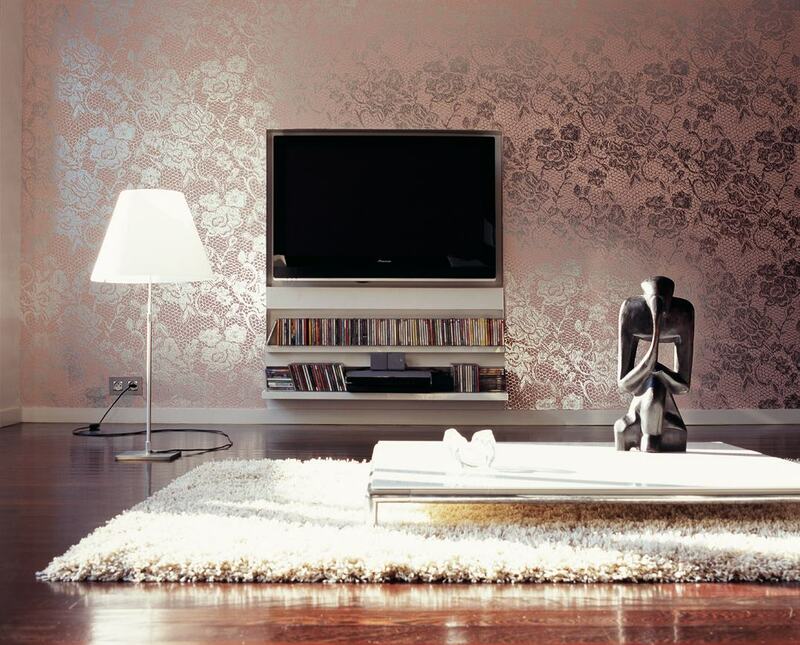 In the living room, metallic wallpaper infuses a bit of luxury and visual finesse. 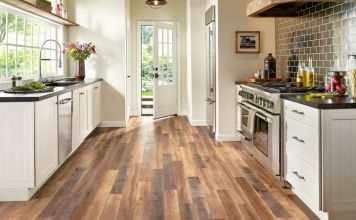 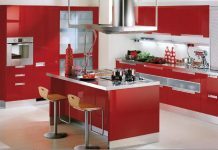 It gives the room dimension and texture, while casting an overall glow onto the space. 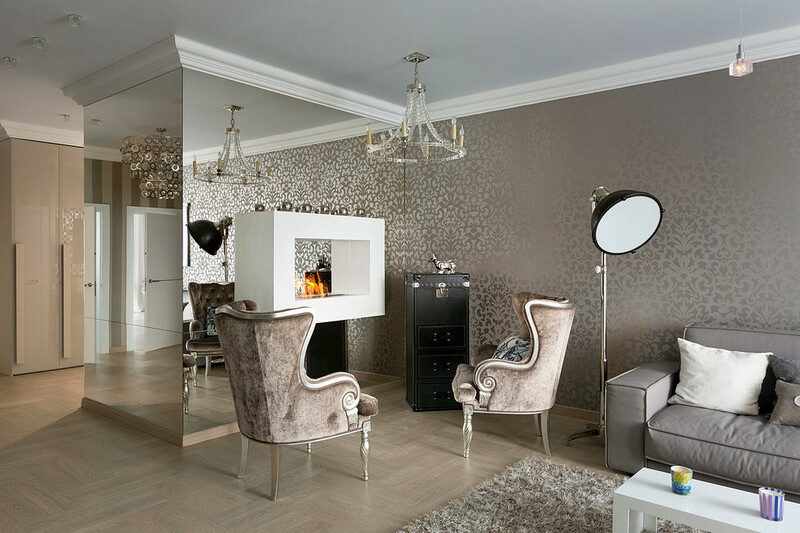 Adjacent to a mirrored wall, silver metallic wallpaper gives this space a very modern luxurious appeal. 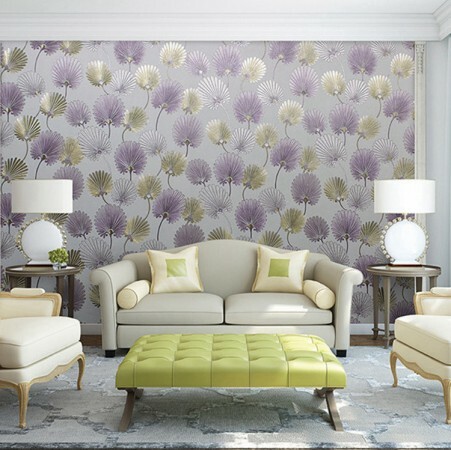 A soft green floral metallic wallpaper gives this modern room character and charm. It adds pattern to the room for a dimensional contrast. 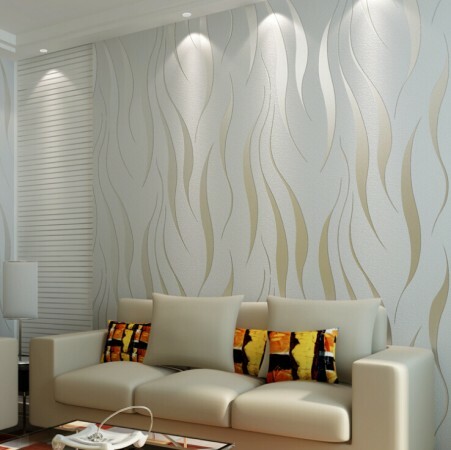 Wavy lines create a room that is modern and relaxing. This metallic wallpaper boldly stands out against the white walls. A soft and elegant vertical wave pattern enhances this room. The down-lights further highlight the metallic shimmer of the wallpaper. This room shimmers with floral panache. 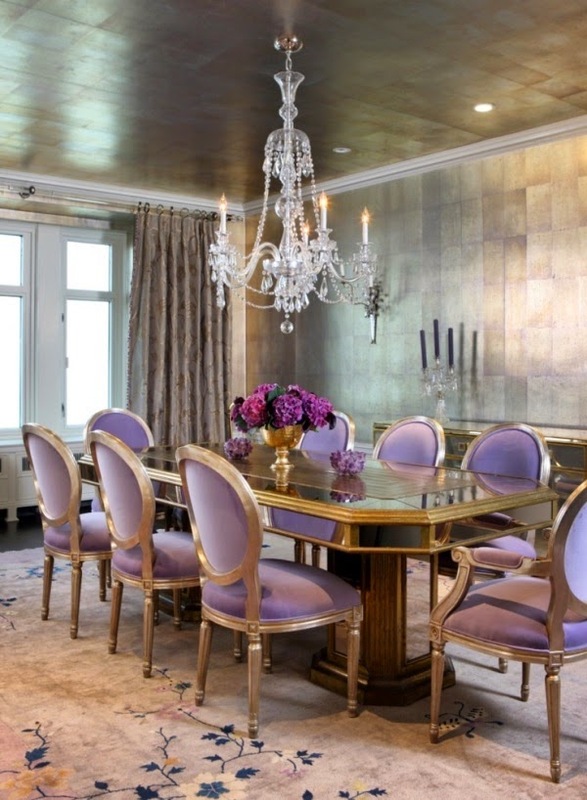 The metallic pattern further enhances the purple in the wallpaper and lifts this room. 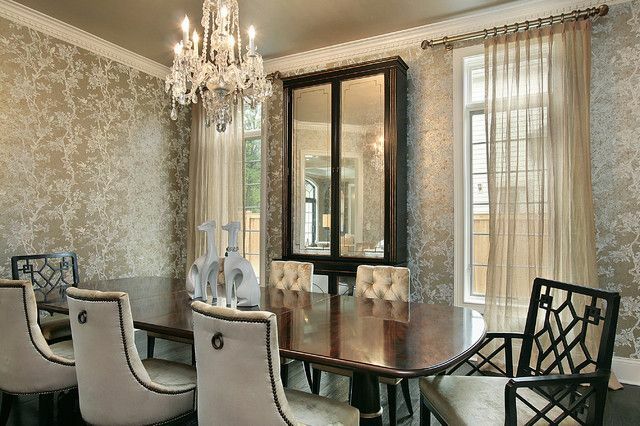 The dining room is a perfect spot for drama and metallic wallpaper delivers. Metallic wallpaper raises the luxury quotient in the dining room. 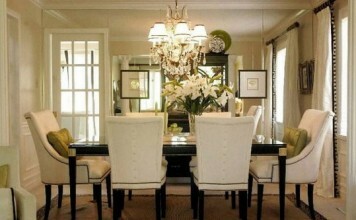 Adding a soft shimmer to the dining room walls lightens up the space and adds glamour. 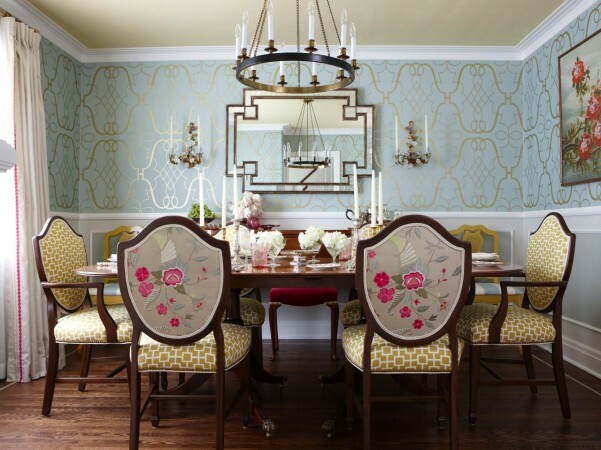 Metallic wallpaper with a beautiful gold design on pastel above the chair rail in this dining room balances the floral motif. 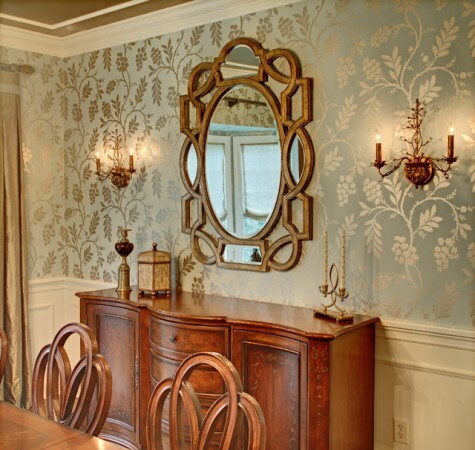 A lovely gold leafy shimmer gives this dining room luster and elegance. 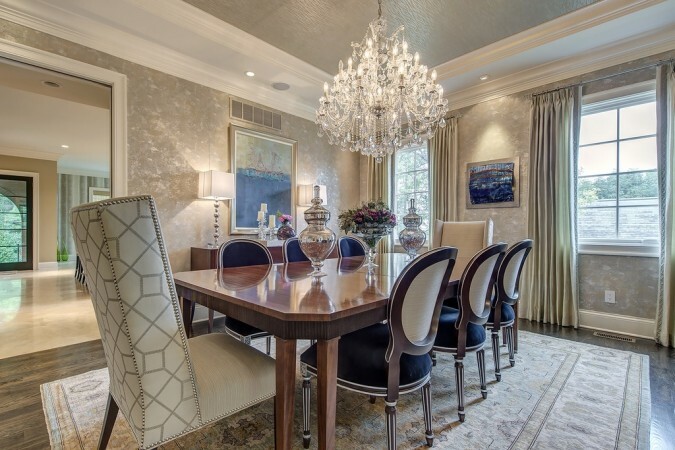 It highlights the warm woods and gilded accents. 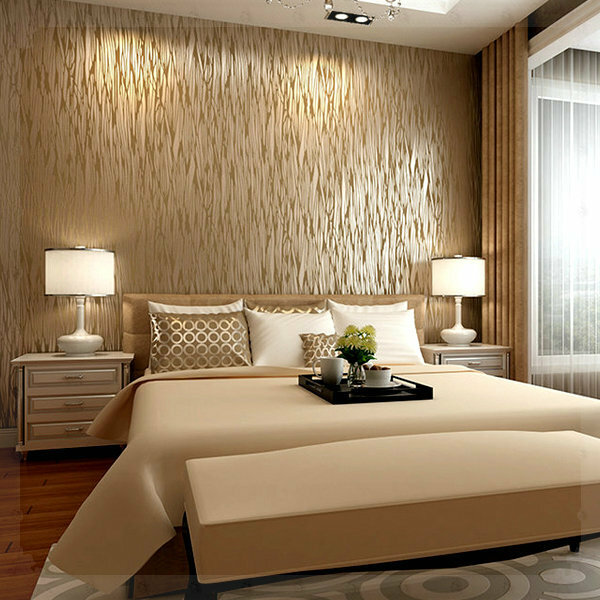 To give the bedroom a boost, install metallic wallpaper. 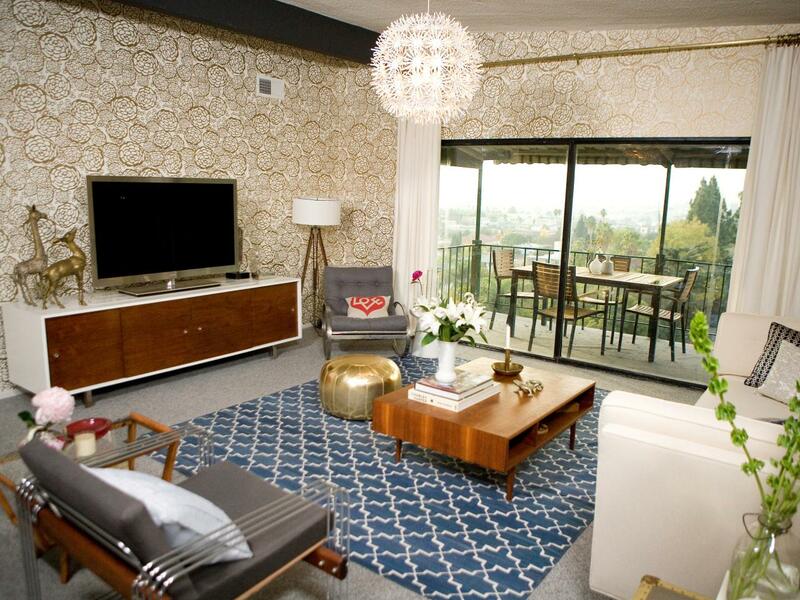 A geometric pattern, whimsical polka dots or a modern design enliven the room and lend character. 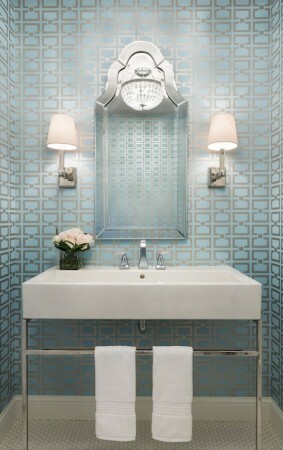 The bathroom, especially a powder room, can benefit from a metallic wallpaper. In a small space, the wallpaper has great impact. Take a risk in the powder room and install a bold and luxurious pattern. 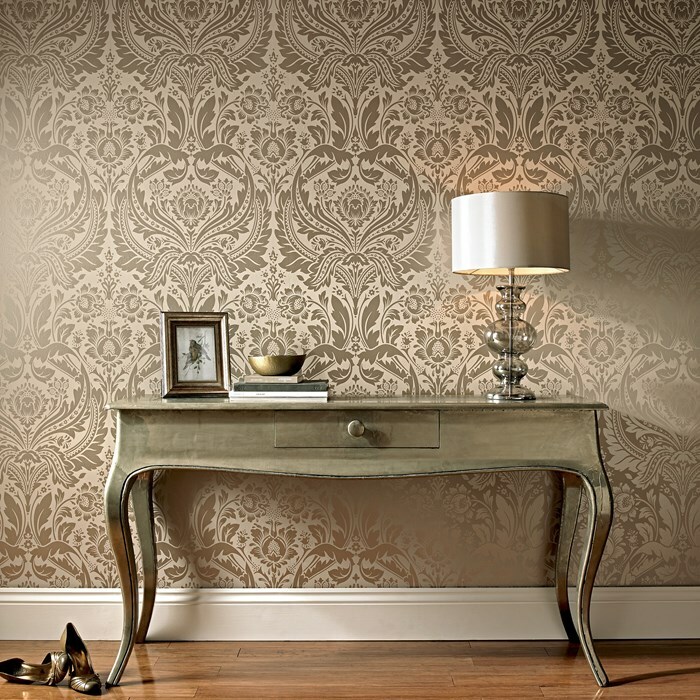 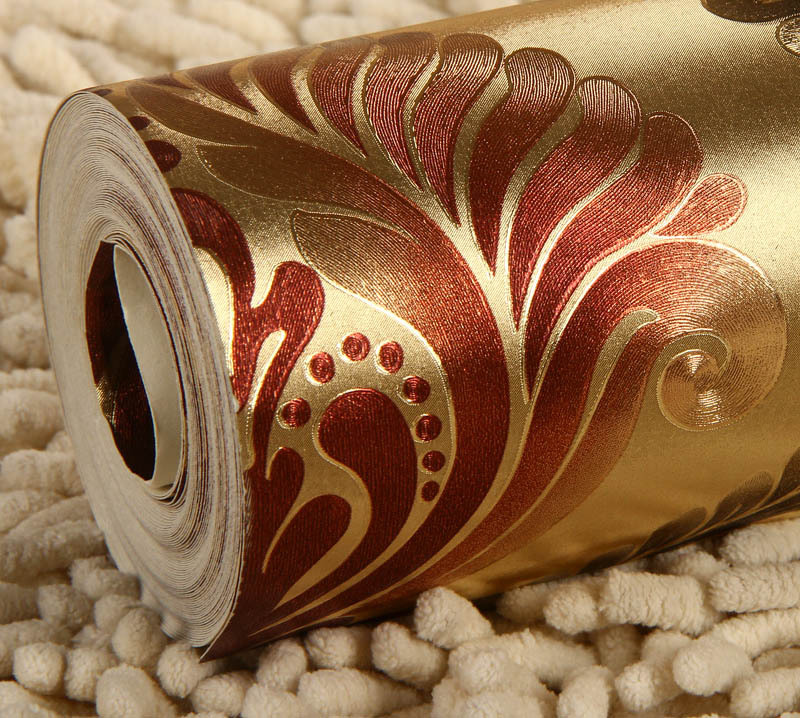 The allure of metallic wallpaper is its lustrous shimmer. 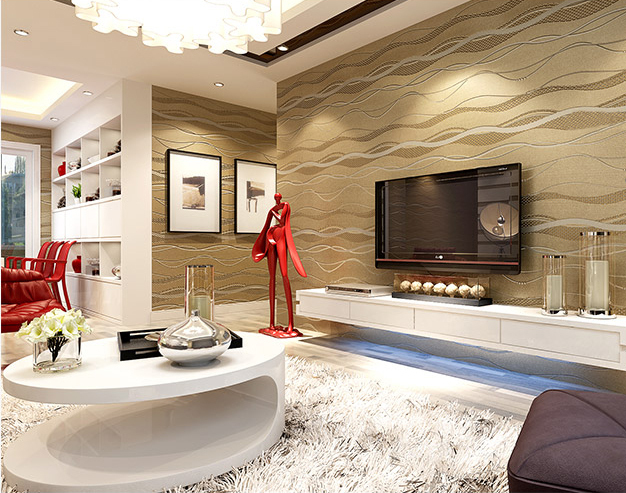 It raises the glamour quotient and adds character and dimension to a space. 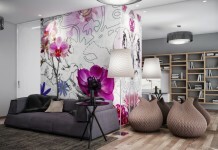 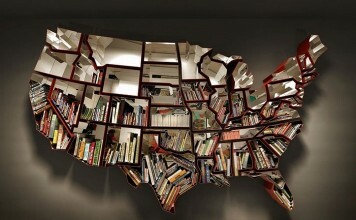 Use it to bring your rooms alive. 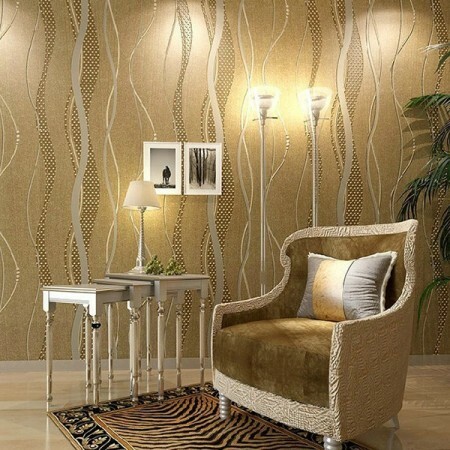 Choose from geometric, floral or other flowing patterns to envelop your living room, dining room, bedroom or bath and enjoy the magic that metallic wallpaper brings to the space.